Impressions de France is a movie in World Showcase - France at Epcot. While it's not the best, it is also recommended. 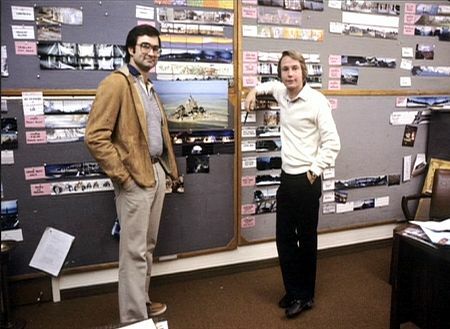 EPCOT "Impressions de France" co-producers/co-writers Bob Rogers (left) and Rick Harper (right) stand in front of the story board for the film. Rick was also the film's director, director of photography and music researcher/editor. This photo was taken in 1980 at Walt Disney Imagineering (it was WED Enterprises then) shortly before filming began. Today Rick Harper and his wife live in Carmel, California. He retired from filmmaking in the early 1990's, pursuing his interest in oil painting. He can be reached at carmelharper@hotmail.com. Bob Rogers is the founder and Chairman of BRC Imagination Arts, headquartered in Burbank, California, www.brcweb.com. Photo courtesy of Marty Sklar. Representing Paris, Epcot's France pavilion uses its buildings to create forced perspectives to make the pavilion look larger and more crowded than it actually is. Disney goes as far to spray bird repellant on its replica of the Eiffel Tower so that birds do not perch on the small-scale tower and look like "monsters." Cliffs of Etretat in Normandy: Debussy - "Solo for Flute"
Marais Poitvin near La Rochelle: Saint-Saens - "Aquarium" from "Carnival of the Animals"
Chambord in the Loire Valley: Boieldieu - "Concerto for Harp and Orchestra"
Chateau Beynat in Dordogne Valley: Debussy - "Nocturne 1"
Bicyclists at La Roque: Offenbach - "Gaite Parisienne"
Hot air balloons near Chateau Chaumont: Ravel - "Daybreak" from "Daphnis et Chloe Suite 1"
French Alps: Debussy - "Clair de Lune"
Skiers in Chamonix: Erik Satie - "Trois Gymnopedies"
Railway tracks in hills of Champeauroux: Saint Saens - "Finale" from "Carnival of the Animals"
Garde Republicaine rides through archway at the Louvre: Dukas - "Fanfare" from "La Peri"
It's wonderfully special and way more than a mere film. This beautiful looking and sounding trip around France is (to the best of my knowledge) the last remaining unchanged attraction in Epcot. The projection and amplification systems may have been updated, but I believe what you see and hear is the same as it was on the day it opened. Films in Canada and China have been updated a couple of times, but I hope they leave France alone. Please.